We use the very latest GPS technology and computer software to help us provide better, more informed nutrient management. With GPS – which stands for Global Positioning Satellite – we first of all establish precise field areas by driving all-terrain vehicles with GPS data loggers around boundaries. Locations are recorded every five seconds. Next, a GPS grid is superimposed on to the fields to precisely locate soil sampling points. Samples are then collected from each grid area and analysed by an independent laboratory. Standard analysis is for pH, P, K and Mg, although other nutrients can also be assessed. 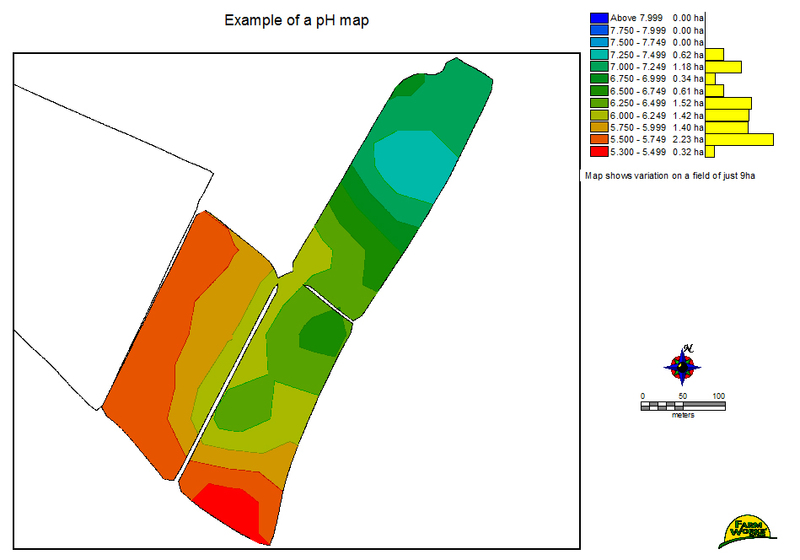 From the sample results, nutrient maps are created to show variations across each field together with prescription maps detailing fertiliser recommendations. These maps provide the key to better, more informed nutrient management, with fertiliser usage tailored precisely to particular field areas. We also undertake standard W-pattern soil sampling. Please get in touch to find our more about either method. Tests undertaken include PCN Analysis, Basic Soil Testing and Leaf Tissue Analysis.